Born and bred in Carmarthen, John is a pure product of Welsh Musical culture. He began…Wales John is a pure product of the Welsh Musical culture he began playing the cornet with the Llanelli Salvation Army band when he was 11 years of age. His musical talent developed through the Carmarthenshire music service and he was selected to attend the Welsh College of Music and Drama (then based at Cardiff Castle), as a part time student where he studied Trumpet under Colin Casson (BBC Welsh Orchestra). He was selected for The National Youth Orchestra of Wales and studied under William Lang (London Symphony Orchestra). John is a founder member of the British Police Symphony Orchestra and held the position of principal trumpet from it’s formation in 1989 for over 20 years. He has also been principal trumpet with the Welsh Philharmonic Orchestra, Philomusica of Aberystwyth and has performed with the National Sinfonia of Wales, the Welsh Chamber Orchestra and freelances with other orchestras across the UK. He is Director of Music for the UK National Police Memorial Day and has previously been musical director of Carmarthen & District Youth Opera, Merlin Youth Theatre and was the founder director of The ‘Myrddin Chorale’ a Carmarthen based mixed choir. 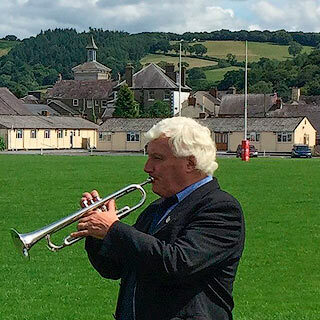 He is now the proud conductor of Band Tref Llandeilo Town Band a local wind band formed only recently to participate in local events and encourage local players of any age or ability to enjoy making music.